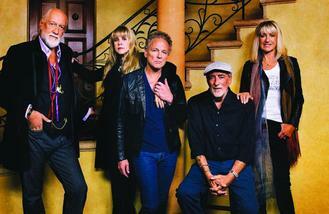 The line-up of the group - which typically comprises Christine, her ex-husband John McVie, Mick Fleetwood, Lindsey Buckingham and Stevie Nicks - has changed over the years with certain members leaving for periods of time, but the singer admits there is always something that draws them back together. "It's that invisible chain. It's that alchemy. I love every minute of it. This is what I want to do. It's what I want to invest my time and my future in from now on, so I won't leave again." And her bandmate Lindsey is surprised they have stayed together for so long because they never "belonged" in the same group in the first place. He told Uncut magazine: "Why are we even still together as a band? It's crazy. This group of people didn't belong in the same band together in the first place, but here we are, 40 years later. "There have been all of the breakups and all that stuff, but there's a lot of love underneath." The two musicians have collaborated on an album together, 'Buckingham McVie', but insist that it won't be an ongoing project for them away from the band. Christine said: "It really is a finite project. It's not a career move. It's just a nice splinter off the main artery of Fleetwood Mac." Ed Sheeran made James Blunt feel "uncomfortable" when they wrote songs together. Lily Allen has said her new album will focus on her marriage breakdown and struggles with substance abuse. Mel B reportedly wants to “make amends” and repair her relationship with her family following a nine-year feud. Mel C joined the 'School of Rock-The Musical' cast onstage for a special performance of 'Wannabe'. Union J hope their new music will attract a male audience. Louis Tomlinson reportedly has the support of Simon Cowell following his airport scuffle earlier this month (Mar17). Popstar Nelly Furtado decided to take a break from music after falling out with her ex-manager. Swedish singer Zara Larsson struggles with sleep paralysis when she is under a lot of stress. Kasabian have announced that their new albumFor Crying Out Loudwill be released on 28 April.